The Official Website for the City of Seattle is dedicated to congregate information about Seattle, from business, services, to tourism standpoint. Design is quite modern but formal, since we believe it is geared towards a variety of people and ages so it suits them best. Although it is also dynamic, with photogalleries rolling on top of each section, it also contains videos regarding a particular topic on almost each section, depending on the nature of each one, whether promotional or a mayor’s speech containing a video channel. 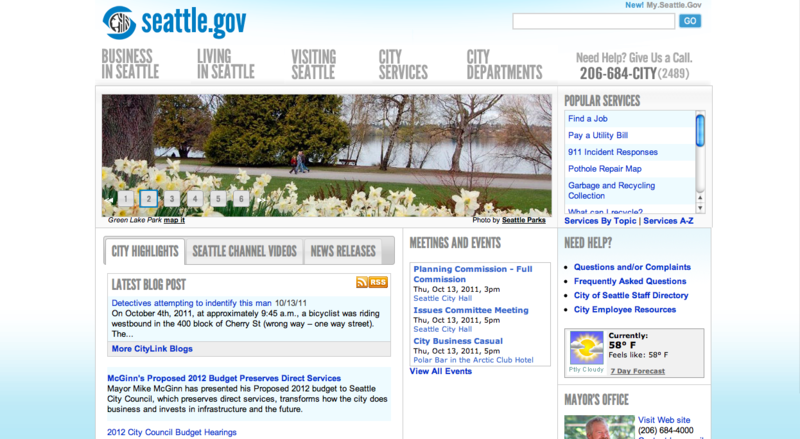 Seattle’s website is geared towards its residents, businesses, and visitors. They visit the site to find information on the latest developments, policies, and news occurring in their community. There is a vast amount of information and updates on public services and public events so that the audience can communicate directly with the city office, mayor, council etc. It is an informational website open to the public of all ages. The business goal of the city is to keep it’s residents happy, safe, and well informed. The purpose of the website is to provide information on city sectors, news and resources for the residents of Seattle or other people in search of information about the city of Seattle. There are no advertisements on the Seattle website, therefore providing a clean and well organized space for its information. There is an easily accesible Contact section for many of the City officials. Also listed on the website is Twitter, Linkedin, Reddit, Tumblr, Facebook, Digg, Blogger, Delicious, and various Retweet and Facebook Like buttons for officials and officers of the City. The Seattle government website is well-organized in sections and subsections that enable users to find information easily and to return to the previous page, since they either can use the “back” button or click on the main sections located on top of page. The design is quite modern but formal, since we believe it is geared towards a variety of people and ages so it suits them best. Although it is also dynamic, with photo galleries rolling on top of each section, it also contains videos regarding a particular topic on almost each section, depending on the nature of each one, whether promotional or a mayor’s speech containing a video channel.There is an evident balance between information and visual media. Easily navigable, the website always keeps the menu tab on the top for easy access to other sections of the website. The website reflects the attitude of the City’s people with its aesthetic presence. It’s simple organization is beneficial for those older, less tech savvy, audience members in search of important information. The more complicated media is still available however in a separate section. Videos, photo galleries, and multiple social media links are listed in other sections, not to confuse those users who are not familiar with these technologies.